The first edition, Pie Tops I, came out this same time last year but were only given out to select celebrities and members of the media. Both shoes are embedded with a button that orders pizza (using Bluetooth to connect to your phone and Pie Tops app) but the Pie Tops II can also pause your game (as long as you have that functionality set up with your cable provider and don't want to use the remote for whatever reason). If the novelty or concept appeals to you, you can try buying one of the 50 pairs that will be available at www.hbx.com, the online curated apparel store from Hypebeast, the week of March 19, 2018. The pizza chain has also been giving out some pairs on its social media channels. 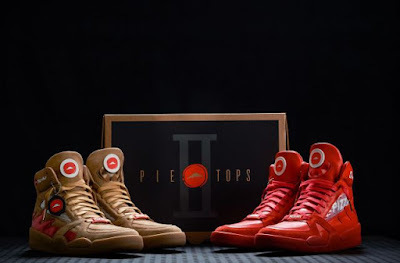 - "Branded Pizza Hut lace tags"
- "Extra 'cheese pull' laces"
- "Mixed material upper – patent, suede, nubuck and gum"